Paddle adjustable for carry height and angle. Easy one-handed draw for handcuffs. 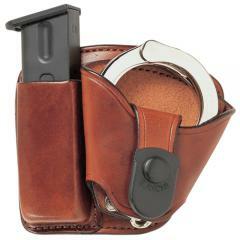 Accommodates standard, large and hinged handcuffs. Plain tan or black. The color is uneven and much darker than other Bianchi tan leather gear. This one's great, I got mine in black. I tried a different brand, it was sent back the day after I received it. Looks good, fits well, and secure. Well made.